Handbags are not my specialty. In fact, I’ve never even owned a European Carry-All. But, intellectual property and art are subjects that I’m very interested in, and that is why I am writing this article. Designer accessories are extremely popular for a variety of reasons: they are expertly crafted, made from the finest available materials, designed or approved by masters in the field and, without a doubt, status symbols. But for as long as people have been creating things, others have been modifying those creations. It’s why Intellectual Property rights were created. And now we come to why I’m writing about handbags: the Mirfkin. In short, a husband wanted to get his wife a special gift. So special that an uber-expensive Hermes Birkin was just not enough. So, he looked around a bit, found a couple of renowned graffiti artists, and asked them to turn the already rare handbag into something wholly unique, which they did with aplomb (honestly, I think the design is pretty cool, but as I said earlier, handbags are not my specialty). He made his wife very happy, and he left the entire fashion world atwitter. “Would this be the start of a trend?” “What does it mean for designers?” “What are the legalities of this?” Well, as for the first two questions, I have no idea, but other forms of art have consistently been used as a basis for new and interesting work (think The Odyssey and Oh Brother, Where Art Thou? ), so I see a possible expansion of the creative impulse there. As for the legal issues, they are interesting albeit a bit murky. First, designers can apply for the very strong backing of a patent. Here, it would be a design patent rather than a utility patent. The design patent lasts for fourteen years instead of the twenty that a utility patent warrants, but it offers many of the same protections. Basically, you patent your design then you get to control its distribution. This works well in preventing large scale manufacture of knockoffs. So, designers should not have much to worry about there. 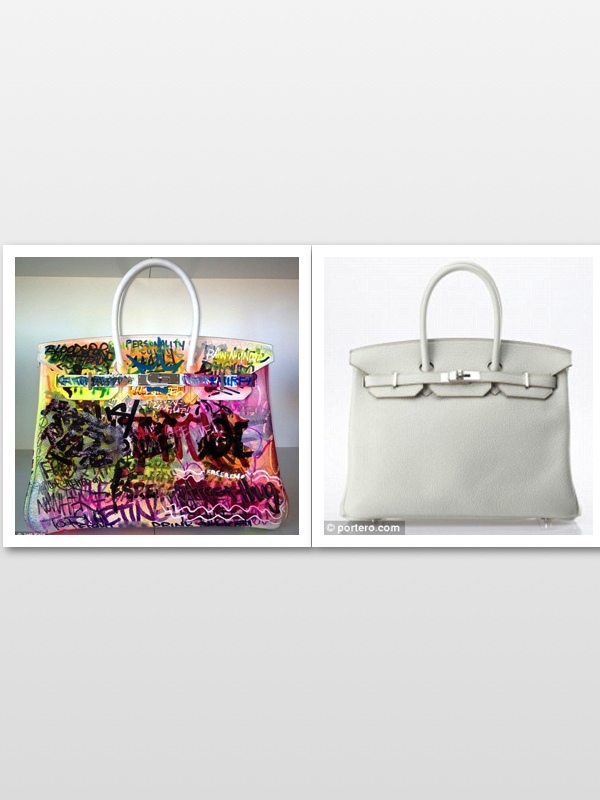 But what about the artists who rendered that basic Birkin into the exotic Mirfkin? 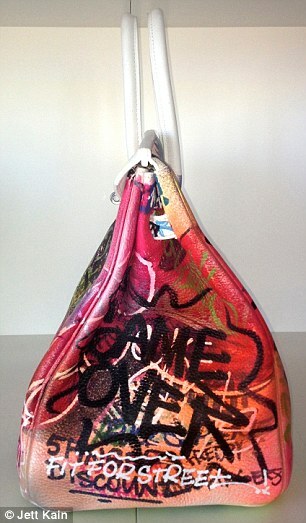 Well, the basic copyright protections would apply to the improvement of the specific bag (for one of two reasons: because the aesthetic aspect can be divorced from the functional aspect of this bag…basically, the bag was used as a canvas, or because the graffiti sufficiently alters the bag design to make a new work). So, Lynn Ban (the lucky wife) owns the bag and can display it as she pleases, but unless the contract for the redesign stipulated otherwise, Mint & Serf (the artists) retain rights to the actual redesign. What does this all mean? 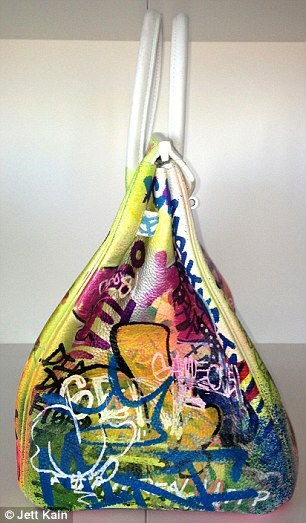 It means that designers and artists will keep their intellectual property protections, but there may be some murky areas going forward when we run into the differences between using a bag as a blank canvas and incorporating artistic aspects of the original bag into a new design (possibly creating a derivative work, or a trademark suit if it involves the a well known designer symbol). However, it also looks like this crossover of design may spark a whole new world in high end accessories resulting in greater collaboration between designers and artists and further open the floodgates of creativity. 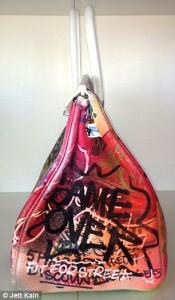 I, for one, cannot wait for my Warhol inspired designer murse. Rick Licari is a graduate of The College of the Holy Cross, from where he earned a BA in English Literature and a graduate of Suffolk University Law School, from where he earned a JD. Along with studying Literature in college, Rick became passionate about films and movie-making. While in law school he studied international law, with a business heavy focus. 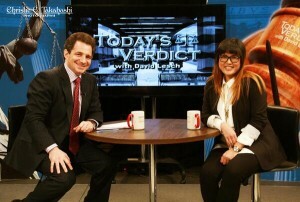 After law school, Rick became interested in the way new media affected property rights especially in relation to books and films. He is currently a litigation support attorney in NYC, a sometime general practitioner, a copy editor at Bleacher Report, and a writer of fiction.